Photo taken on a recent trip to Golspie with the ‘Ten under the Ben’ team in training. Click on the photo for more – including a short video clip. Staffing – All parents received details of cutbacks planned by the Highland Council in teacher staffing. (The text of the letter is available here on the Parent Council website.) The wider press has indicated issues arising in many secondary schools across the Authority as a result. In Gairloch the subjects affected will include History, Business Studies and PE. The school has had to put forward a plan to the Council that meets its requirements for cutbacks. The Parent Council is currently collecting views on this and plans to write to the Director and Councillors. Headteacher, John Port confirmed that an incident took place recently in the school involving cannabis. It was dealt with in line with Highland Council Policy and as a result the Police were called in. Three pupils were excluded. Although incidents like this are rare in Gairloch we are aware that there are drugs available in the community. We treat such incidents very seriously and will act swiftly to maintain a safe environment in the school. As part of our ongoing Personal, Social and Health Education programme staff work with several outside agencies to help develop appropriate and responsible attitudes in all our pupils to many issues including drugs. It is our hope that the majority develop the strength and resilience to manage such issues as they arise. After the holidays we are planning some awareness work in PSHE. Any parent or member of the community, who wishes to discuss concerns about any issue including this one, is welcome to make an appointment with the Headteacher via the school office. Senior Outdoor Education trip – The S5/6 Outdoor Education and fitness course culminated in an energetic three day trip (18th – 20th March) to the Highland Council Lodges at Badaguish, near Aviemore. The twelve participants climbed Meall a’Buchaille and Cairngorm. 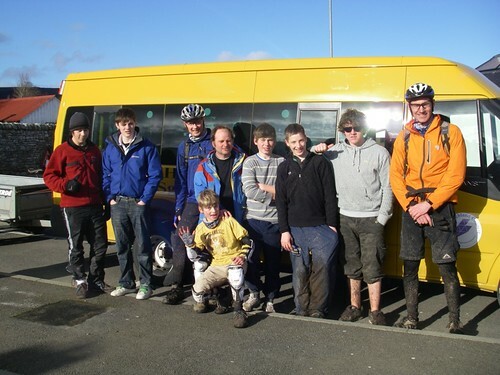 They mountain biked at Laggan Wolftrax and on single-track trails around the Glenmore/ Loch Garten area. Mr. and Mrs. Johnston, Mr. Sutherland, Miss Dean and Mr. Milner accompanied and instructed the pupils at different times over the three days. This was a great way to finish the course, using fitness gained over the last six months to introduce skills and techniques – like how to use ice axes and crampons – that could last a lifetime. There are a selection of photos of the pupils involved in these activities on the school website. Chess competition – The school had its annual chess competition with a record number of pupils participating this year. Once again, the winner was our defending champion Catriona Leyland with Cameron Jones and Ann Sabu finishing second and Kalvin Fraser in third place. Well done to everyone who played earning house points in the process. The final points were Kerry 18, Maree 10 and Tollaidh 8. S1-3 Year of Homecoming Burns Showcase Evening – The Celebration of Burns and Scottish Writing event on Thursday 26th March was a success, raising over £200 for the school’s Malawi Project and CLIC Sargent. All pupils in S1, 2 and 3 were involved in their English classes and over 70 pupils took an active part in the show itself. With the help of Eden Court’s Islay MacRae, many pupils have successfully carried out activities for which they might never have volunteered. The English Department would like to thank Islay, all staff and parents who supported the project and, of course, the pupils. There is a selection of photos of the event on the school website along with some more detail of the evening programme along with a winning short story by Josie Ogle. We hope to add some video sequences soon. Pupil Success – Here’s the most up to date house points and we’ve included the leader in each house in case you’re interested in that as well. Note that the leaders are all girls! Handball – More success for the Gairloch team as they beat visitors Inverness Royal Academy. The team was formed and is coached by Ross Matheson so all credit to him for the opportunity that this provides a range of pupils aged between 13 and 17. Ross has written a detailed account of the event and it is available on the website and in the local press. Neil Gunn Writing Competition – As term ended we were informed that two of our S3 pupils have achieved success in a Highland based writing competition aimed at S3-S6. Isabella Claydon has won third prize with a story called She and Conal McDonagh has received a commendation for Block 616. We hope to publish the stories on the website shortly. Cross-country event – On the final day of term, 72 pupils took part in an inter-house cross-country event at Flowerdale. The course was approximately 5km long, hilly and very muddy! Team results were calculated by combining the times of the first 2 boys and girls in each house. In the S1/2 event, Maree were 1st, Tollaidh 2nd and Kerry 3rd. Kalvin Fraser won the race comfortably. In S3/4, Tollaidh won, with Maree in 2nd place and Kerry 3rd. All 3 teams were extremely close. Matthew Fothergill was the individual winner. In the Senior race, Maree were 1st, Tollaidh 2nd and Kerry 3rd. Derek Martin was the individual winner. Well done to all those who took part. House points will be added to the totals given above. Click here for a slideshow of photos. Study Club – Many of the S4,5 & 6 pupils took part in study club along with teachers over the first three days of the holiday. This annual event allows pupils to concentrate in a focused, relaxed environment. Feedback is always good and indicates that it helps set the pupils up for the coming onslaught of the exams. Monies raised – The S1 Bring and Buy final total collected was £2249. The Phoebe MacAskill Dance event held earlier in the year raised a final amount of £1512. Well done to everyone involved in helping raise these considerable amounts.